Successful surgery has three requirements: clear thinking, technical skills and advanced planning. And who better to teach surgeons approaches to these requirements than other surgeons? I couldn’t have put it better myself. Surgical education that centres the skills and knowledge that surgeons need, and that communicated from surgeon to learner, has long been a staple of procedural learning. A key challenge for learners is getting that face time for the first step in the ‘see one, do one, teach one’ approach to education. So if surgeons and trainees cannot go to the procedure, why not bring it to them? 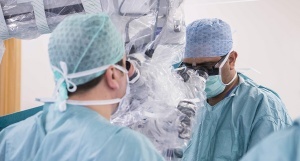 Every step of every procedure – from pre-op consultation through to discharge – needs to be included to contextualise what happens in the operating theatre. The critically important components are (1) being able to see the details of real anatomy, and (2) receiving detailed operative advice and insights directly from surgeons experienced in the procedures. Indeed, “the greatest value is the … wisdom that an experienced surgeon transmits.” This approach is the most direct way of teaching, and quickly imparts the desired skills, due to the ‘direct relationship’ created by peer-to-peer education. There’s nothing new about the internet at this point, but its full potential for surgical education remains untapped. One of the key benefits is the seemingly infinite capacity, which means sites such as OrthOracle can host dozens to hundreds of the highest-definition procedure photographs, and as much surgeon-narrated technical detail as each operation requires. Online learning lets surgeons directly access the shared knowledge of their peers, when and where it suits their schedules, which in turn meets the training goal of increasing the learner’s self-efficacy. In line with Kirk’s advice for surgical learning, OrthOracle gives surgeons and trainees the opportunity to revise the anatomy in detail, to observe how experts utilise and exploit the tissue and techniques, and to understand the carefully developed pathway principles that each procedure type must follow. Although it cannot replace hands-on operative training, modular online teaching lets learners understand the “series of minor procedures” that make up each operation, and that success relies upon every step being the correct one in the sequence and performed precisely. We’re aiming to create the most complete catalogue of orthopaedic surgical modules – created by and for surgeons – so that learners can choose the best operative solution for their situation, and learn how to do it. Every detail of every step, of every procedure we post. That’s OrthOracle’s promise to surgeons. Note: Originally posted on LinkedIn. 1. Paydar S, Ghahramani Z, Bolandparvaz S, et al. Learning operational strategies in surgery training. J Adv Med Educ Prof. 2014;2(2):92–94. 3. Kirk RM. Surgical skills and lessons from other vocations: a personal view. Ann R Coll Surg Engl. 2006;88(2):95–98.